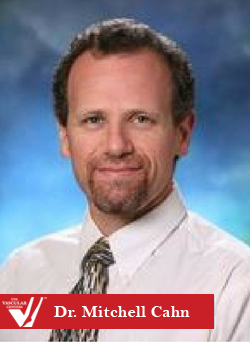 Dr. Cahn has been in practice since 2001 and is well trained in all aspects of vascular surgery, including venous disease, open and endovascular techniques, treatment of aneurysms, carotid disease, peripheral arterial ischemia, renal and mesenteric circulation abnormalities, and dialysis access. He is board certified in vascular surgery and general surgery, having graduated from the University of Pittsburgh School of Medicine and completing a general surgery residency at the University of California, Irvine Medical Center. Dr. Cahn completed his vascular surgery fellowship working with Bruce S. Cutler, MD, at the University of Massachusetts Medical Center. Dr. Cahn believes in providing the best possible care by allowing adequate time for patient interactions and by providing sufficient information to allow each individual to help choose the most appropriate treatment. Dr. Cahn comes to USA Vein Clinics from the Polyclinic here in Seattle. He has a wife and three sons. His interests include downhill skiing and he enjoys exploring the great outdoors of the Pacific Northwest.